© 2002, © 2016 by Paul Freeman. Revised 9/3/16. 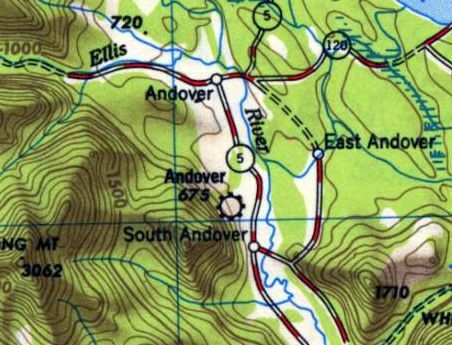 Andover Airport, as depicted on the 1950 USGS topo map. Photo of the airport while in use has not been located. 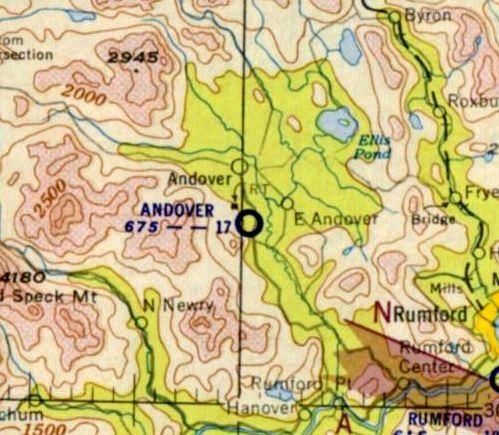 The earliest depicted which has been located of Andover Airport was on the 1950 USGS topo map. located on the west side of Route 5, south of the town of Andover. 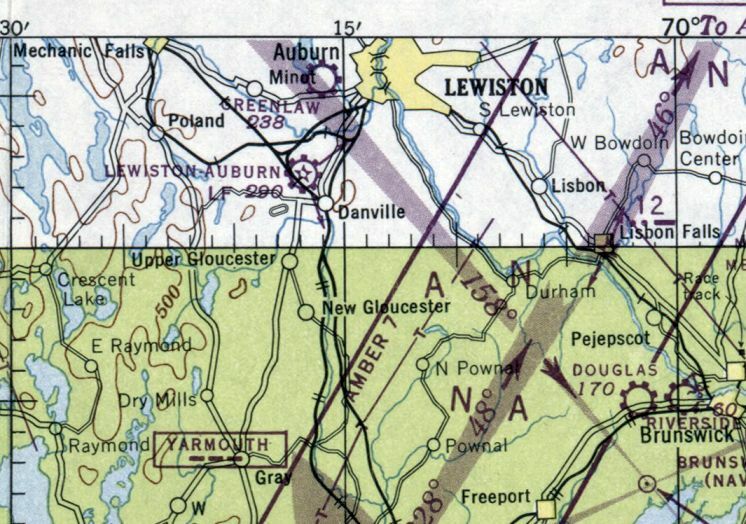 The only aeronautical chart depiction which has been located of Andover Airport was on the 1952 Lewiston Sectional Chart. 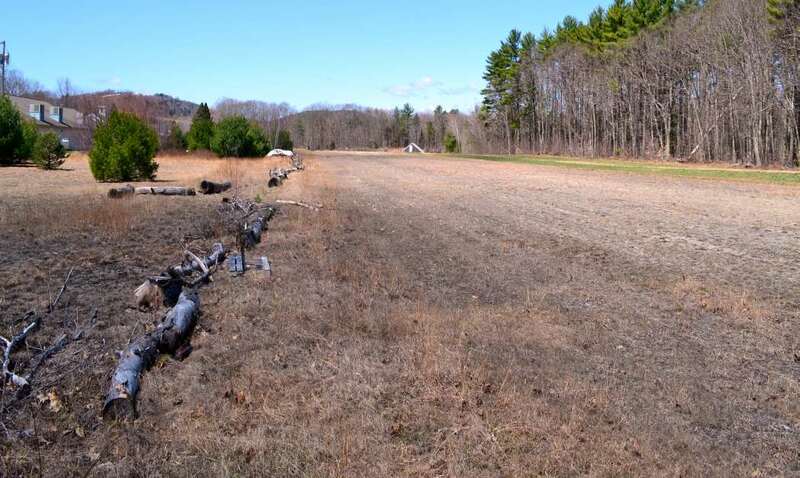 It depicted Andover Airport as having a mere 1,700' unpaved runway. 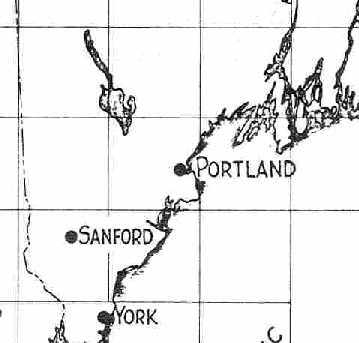 as it was no longer depicted on the 1956 USGS topo map nor on the 1962 Lewiston Sectional Chart. 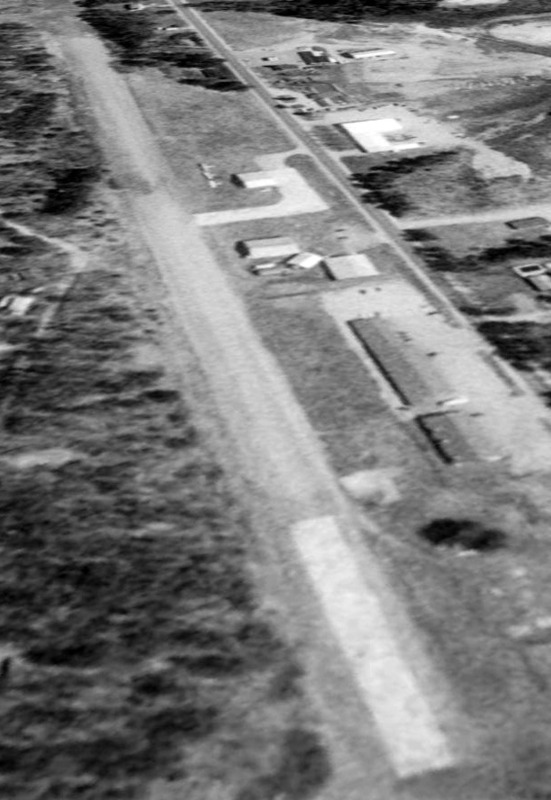 The only photo which has been located of Andover Airport was a 5/5/65 USGS aerial view. It depicted a clearing on the west side of Airport Road, with several possible unpaved runways. But there were no aircraft visible on the field, or any other indication of recent usage. 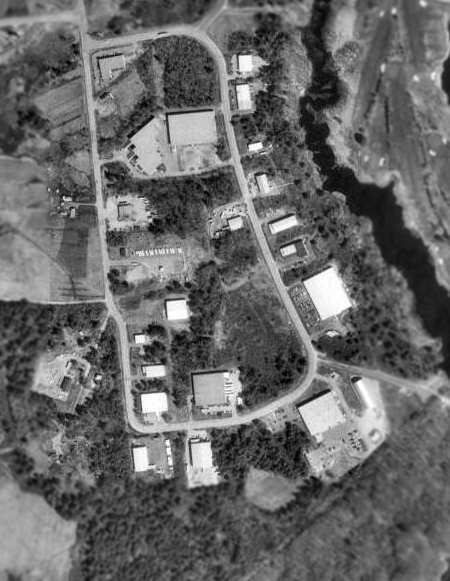 A 1997 aerial photo showed no recognizable trace of Andover Airport. 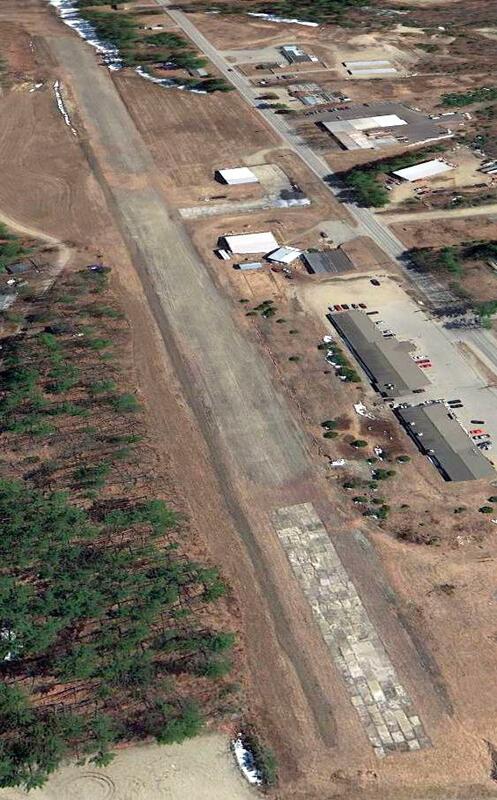 A 2013 aerial photo showed no recognizable trace of Andover Airport. Deb Cayer reported in 2015, “A neighbor (Jim Coolidge) just uncovered a cement airport marker. It's located just off Airport Road where I'm told there was once an airstrip. It had been buried for years by a softball or baseball group that built a field on the site. Luckily a long-time resident remembered playing trucks there on the circle. 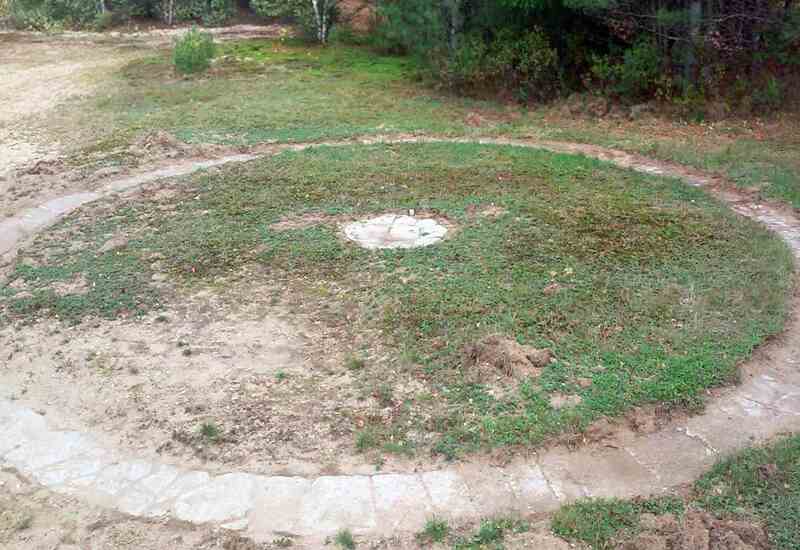 A 9/21/15 photo by Deb Cayer of the unearthed circular stone airport marker at the site of Andover Airport. The site of Andover Airport is located west of Airport Road, appropriately enough. Thanks to Deb Cayer for pointing out this airport. Limerick Yarn Mills Airport, as depicted on the January 1950 Boston Sectional Chart. which depicted it as having a mere 1,500' unpaved runway. as it was no longer depicted on the May 1955 Boston Sectional Chart. 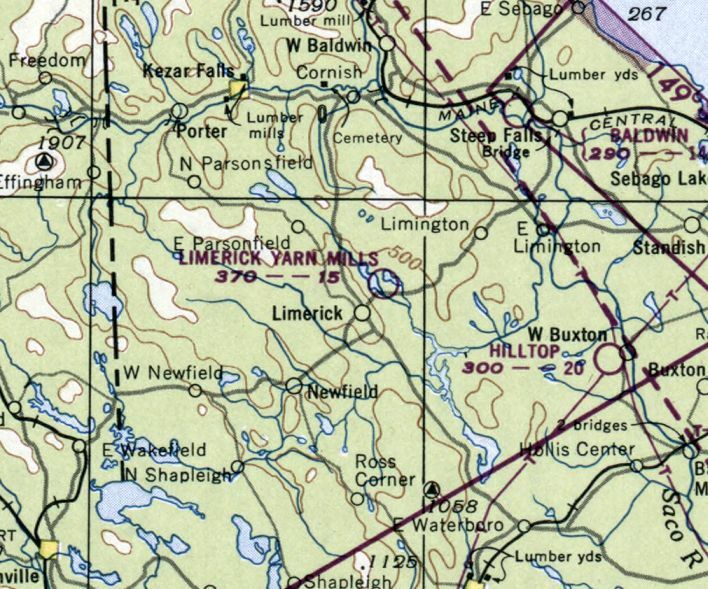 No airfield was depicted in Limerick on the 1973 USGS topo map. After several decades, the airfield in Limerick was evidently reestablished in the same location at some point in the 1970s. Steve St. Saviour reported, “I talked to my father, and found out the Limerick airport became operational sometime before 1977. According to Norm Bisson, “The airstrip was built by Dana Smith of Limerick. He built the strip for his aircraft mechanic School, Air-Tech. The school was in the hangar. Dana built that as well. Dana was a well-known aircraft mechanic. He was also an FAA mechanic examiner. He tested me for my A&P. According to Dana Smith's obituary (courtesy of Norm Bissson), Dana founded & operated Air-Tech Aviation Maintenance School in Limerick for 28 years. 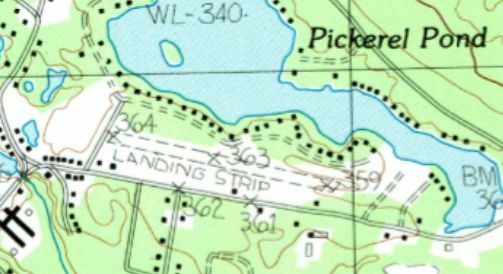 Limerick Airport was labeled simply as “Landing Strip” on the 1983 USGS topo map. 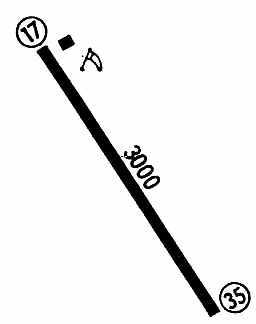 It depicted a single unpaved 2,300' southeast/northwest runway with a few small buildings on the south side. showing 3 single-engine planes sitting next to a hangar on the south side of the runway. A 5/25/10 photo by Kevin Porter looking northwest along Limerick's runway. Kevin reported, “I've done some digging in local libraries & I haven't been able to find much information. Current Sectionals don't depict the airport, despite the fact that it appears to be active. The airport is currently a gravel strip, 1,200'-1,500' in length, perhaps 50' wide. A 5/25/10 photo by Kevin Porter of an Ercoupe & Cessna 175 parked in the grass at Limerick. A circa 2010-2014 aerial view looking south at Limerick Airport showed 1 single-engine planes sitting next to a hangar on the south side of the runway. Note that the eastern end of the runway appeared to have been paved, whereas the majority of the runway appears to be gravel. 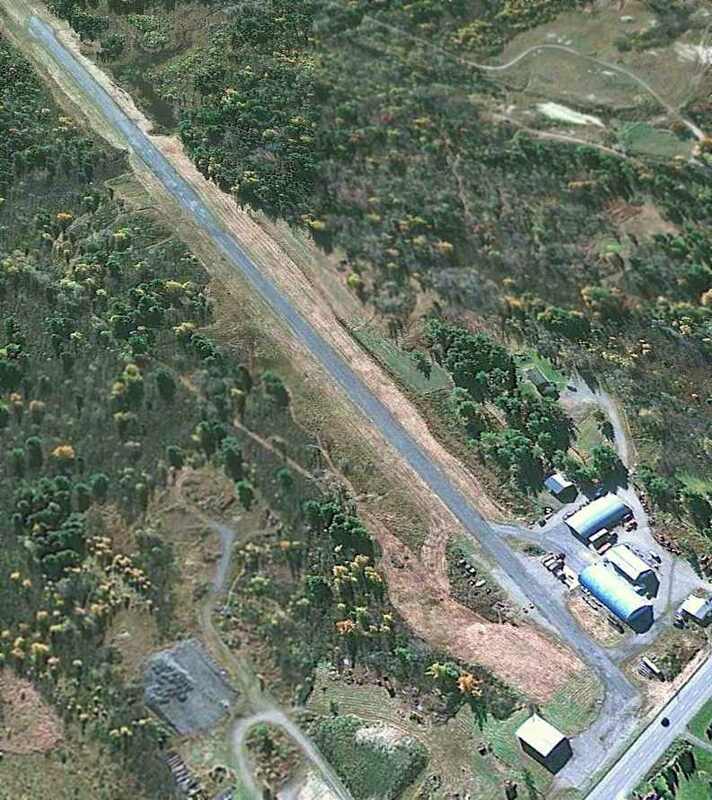 According to Norm, “The patchwork appearance of the paved runway section was due to Dana having a local cement company drop off any leftover cement. According to Norm, Limerick Airport founder “Dana [Smith] passed away in 2013. A 4/7/13 aerial view looking southeast showed the deteriorating pavement on the eastern end of the runway. There were no aircraft visible parked outside. A 2014 photo by Steve St. Saviour looking northwest along the Limerick runway. Steve reported, “The airstrip is well known among the locals of the town. There are 2 airplanes that still takeoff/land there every now & then (an Ercoupe & a Cessna 175), but I think they are just local townsmen. I did happen to talk to one a few years ago, and he invited me to fly up in my Super Viking, but I never had the chance. I heard rumors of some legal incident (an accident) causing the airstrip to become un-public, but that's just heresay, and I can't verify it. A 2014 photo by Steve St. Saviour at a Limerick hangar. Limerick Airport is located north of the intersection of Central Avenue & Hillcrest Avenue. on the June 1944 Lewiston Sectional Chart (courtesy of Chris Kennedy). This little general aviation airport was owned by Roland Maheux. Clarence Dargie recalled, “Roland Maheux was a very interesting character. He never had a flying lesson in his life. He bought what I believe was a Heath Parasol at age 16, climbed into it & taught himself to fly. He opened his airport during the 1930s. The date of construction of the original Maheux Airport has not been determined. in The Airport Directory Company's 1933 or 1938 Airport Directories (according to Chris Kennedy). was in the The Airport Directory Company's 1941 Airport Directory (courtesy of Chris Kennedy). It described Maheux Airport as a commercial field, located 1 mile west of Auburn. with buildings to the east & west, including a hangar. or the 1943 5M Regional Aeronautical Chart (according to Chris Kennedy). as it was listed among active airfields in the April 1944 US Army/Navy Directory of Airfields (courtesy of Ken Mercer). It described the Maheux Airport in Auburn as having a 1,200' unpaved runway. was on the June 1944 Lewiston Sectional Chart (courtesy of Chris Kennedy). It depicted the Maheux Airport in Auburn as an auxiliary airfield. Note that this 1944 chart also depicted the new Maheux Airport, a few miles to the northwest (in Minot). 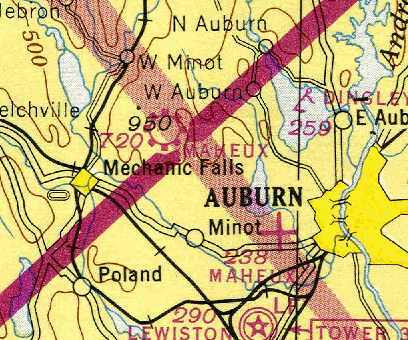 The September 1944 Boston Sectional Chart continued to depict the Maheux Airport in Auburn as an auxiliary airfield. and it developed into an airport which was later bought by Wilfred Charest, aka, The Butcher. Maheu had already opened the new Maheux Airport in Minot before selling the Taylor Pond one to Charest. Rumor had it that bad blood developed between Charest and Maheu over some shady aspects of the airport sale. The single grass runway ran north & south... about 1,200' long. There was an office building & a couple of hangars. The field was owned by Wilfred Charest, a butcher by trade who owned a butcher shop in Auburn. Thus, the field was more popularly known as The Butcher's. most of whom had been banned from other local airports for dangerous & unorthodox behavior. that any of us he caught landing at the Butcher's would be grounded for a month. as airplanes were landing in both directions. as it was no longer depicted at all on the July 1945 Lewiston Sectional Chart (courtesy of Chris Kennedy). as that is how it was depicted on the July 1946 Boston Sectional Chart. 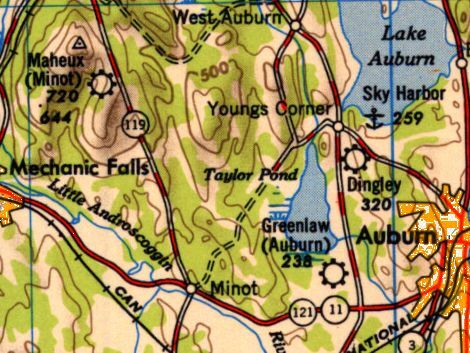 “Greenlaw (Auburn)” Airport, as depicted on the 1950 USGS topo map. The last depiction which has been located of Greenlaw Airport was on the January 1950 Boston Sectional Chart. It depicted Greenlaw Airport as having a mere 1,500' unpaved runway. 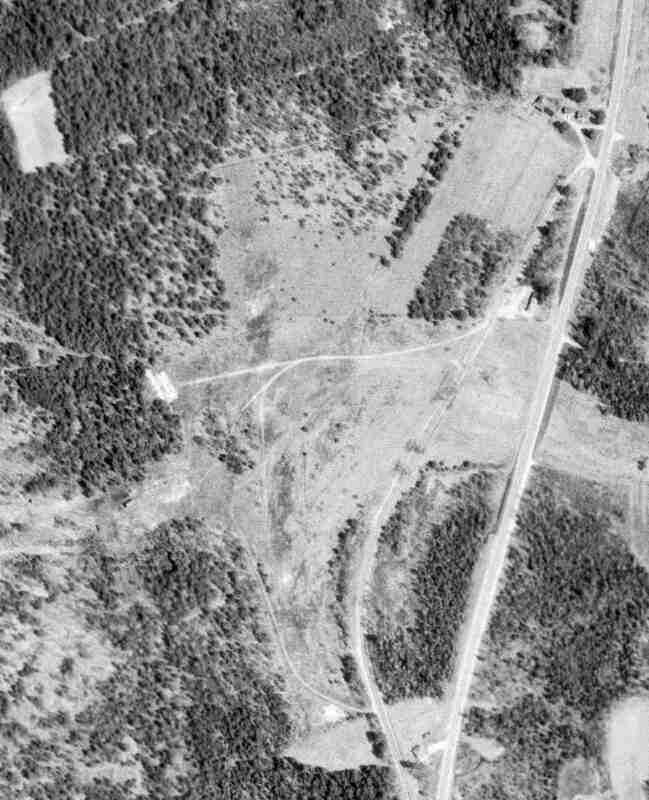 In a 1953 aerial photo, no recognizable trace of Greenlaw Airport was still recognizable. 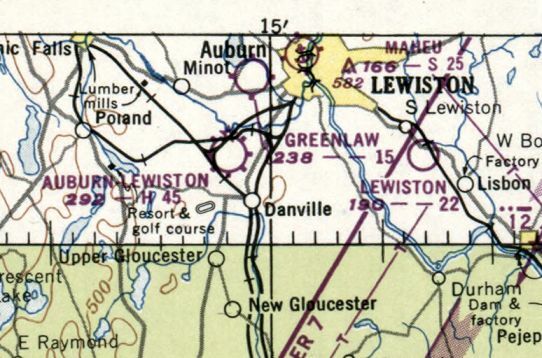 Greenlaw Airport was evidently closed at some point between 1950-55, as it was no longer depicted on the May 1955 Boston Sectional Chart. 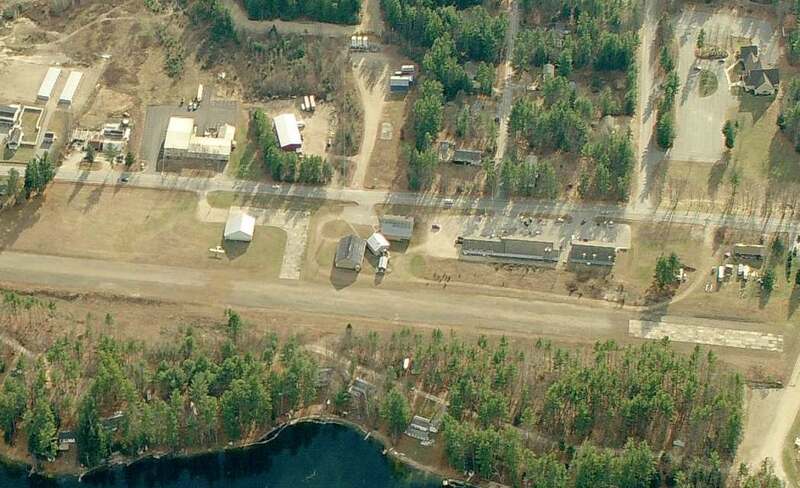 In a 2004 aerial photo, the former Maheux Airport workshop building was visible in the center of the photo. No recognizable trace of the airfield clearing was still visible. A 2006 photo by Norman Houle “of the old airport workshop on the west side of the old Airfield, it is now owned by Columbia River Corp. The site of the Maheux Airport in Auburn is located west of the intersection of Stevens Mills Road & Hotel Road. Photo of the airport while open is not available. This little general aviation airport replaced the original Maheux Airport in Auburn. was in the April 1944 US Army/Navy Directory of Airfields (courtesy of Ken Mercer). It described the Maheux Airport in Minot as having an 1,800' unpaved runway. It depicted the Maheux Airport in Minot as a commercial airport. Clarence Dargie continued, “I learned to fly in Maine in 1946 at Maheu's Airport in West Minot. running north & south on top of a ridge that sloped down toward the valley floor to the west. As a result, we had a built-in crosswind from the west. and was covered with much brush, juniper bushes, etc. On the north was an apple orchard. We had an office/club house building, one maintenance hangar and three or four T-hangars. Clarence Dargie recalled of Roland Maheu, “He was the most skillful aerobatic pilot I have ever seen. roll the airplane on takeoff (although the manufacturer's flight manual warned pilots not to attempt to roll a J-3) etc. holding on the the right cabane strut down near the panel with his left hand. In this manner, he could swing his body alongside the engine cowl & reach the prop in whatever position it stopped. He would then prop the engine back into life & climb back in and continue his routine. The airport's spelling was still listed as “Maheux” on the December 1948 Lewiston Sectional Chart (courtesy of Chris Kennedy). 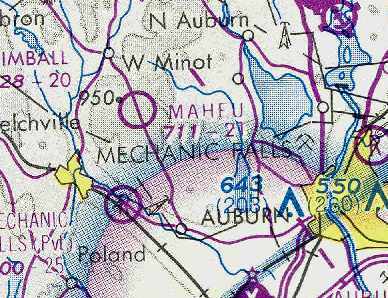 The 1950 USGS topo map depicted the “Maheux (Minot)” Airport. 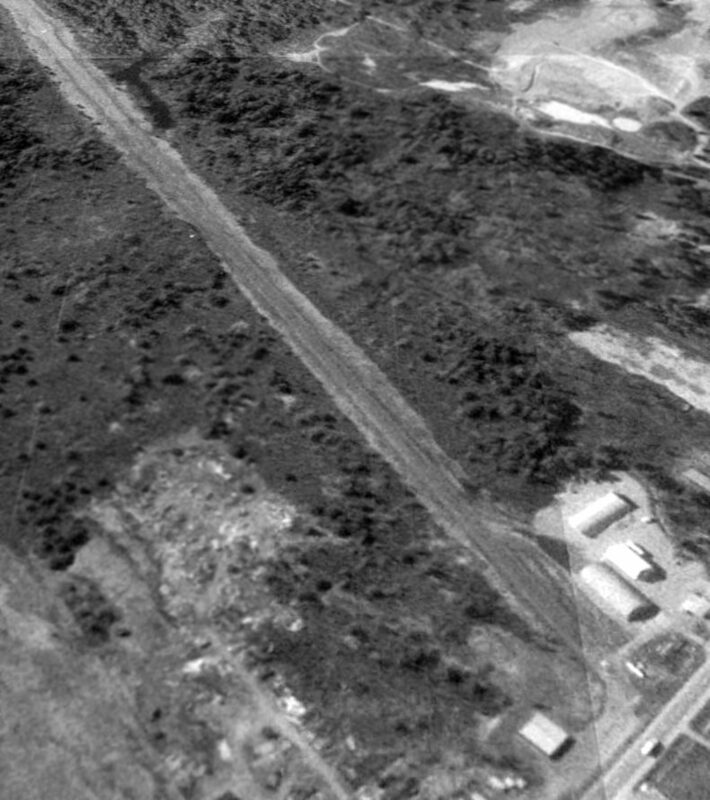 The earliest photo which has been located of the Maheux Airport in Minot was a 1953 aerial photo. It depicted the field as having a single northwest/southeast grass runway, with a hangar & 7 single-engine aircraft along the east side. the spelling of the airport was depicted as “Maheu”. It described the field as having a single 2,100' turf runway. 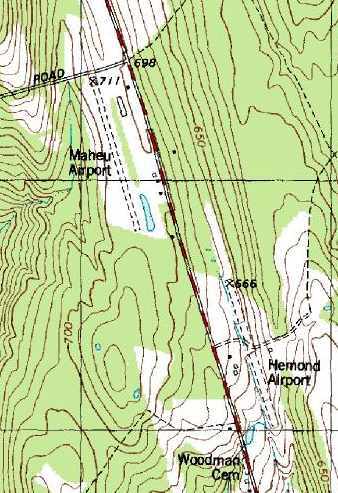 Maheu Airport was depicted simply as “Airfield” on the 1956 USGS topo map. but, to the best of my knowledge, he never damaged an airplane to the point where it could not fly. 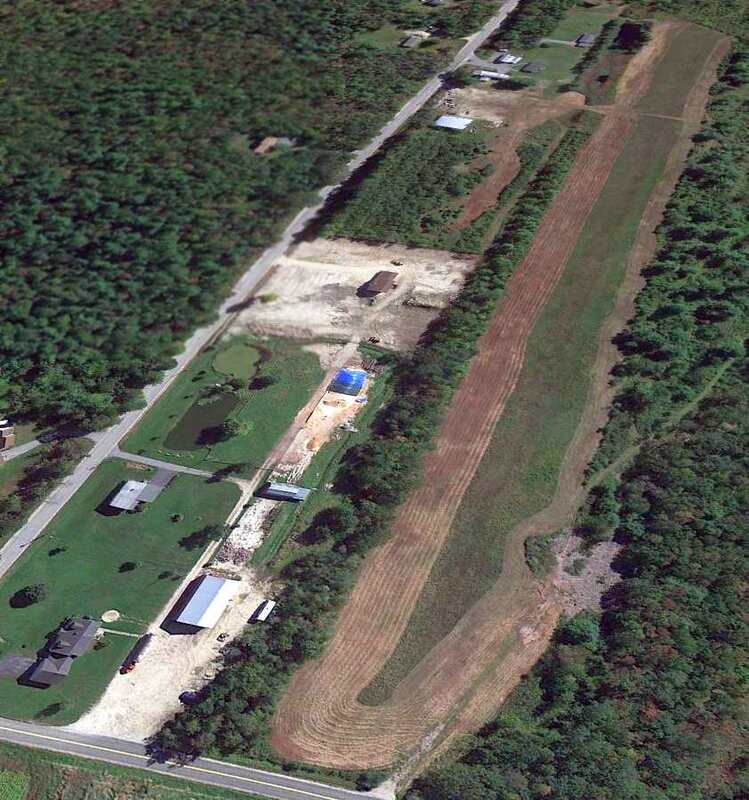 as having a 2,100' unpaved Runway 18/36, with 2 T-hangars & 2 other small buildings on the east side. was on the April 1978 Montreal Sectional Chart (courtesy of Chris Kennedy). It depicted Maheu as a public-use airport having a 2,100' unpaved runway. Note that it also depicted “Hemond Airport” almost directly across the road as well. The date of closure of Maheu Airport has not been determined. 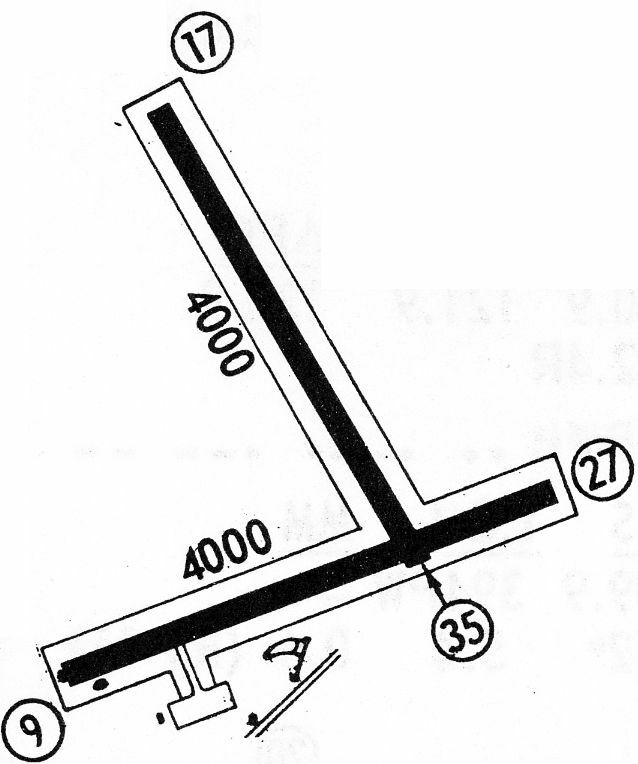 It was no longer depicted on the 2005 Sectional Chart as an active airfield. so it is not apparent if the airfield was still in use at this point. 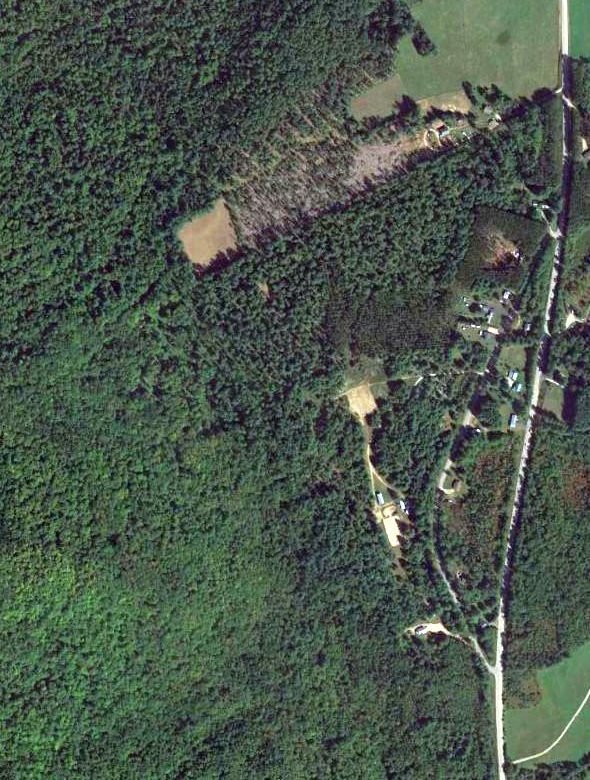 are the home (the dark building) that Roland Maheu built there after taking out the apple orchard & extending the runway another 900'. The cluster on the southeast end, starting with the square light colored northern most building are the old main hangar. There used to be 3 or 4 T-hangars just north of the main hangar but I see they are now gone. South of that, on the other side of the entrance to the airport by the maintenance hangar is the club house/office building. Maheu Airport is located southwest of the intersection of Route 119 & Jackass Annie Road. The St. Croix Airport, as depicted on the 1948 Lewiston Sectional Chart (courtesy of Chris Kennedy). This small general aviation airport was located less than a half-mile from the Canadian border. as it was not depicted on the June 1944 Lewiston Sectional Chart (according to Chris Kennedy). was on the 1948 Lewiston Sectional Chart (courtesy of Chris Kennedy). It depicted St. Croix as having a 1,900' unpaved runway. The 1949 USGS topo map depicted St. Croix as having a single unpaved northwest/southeast runway, labeled simply as “Airfield”. as having a single 3,000' paved Runway 17/35, with 2 small buildings at the northwest end. 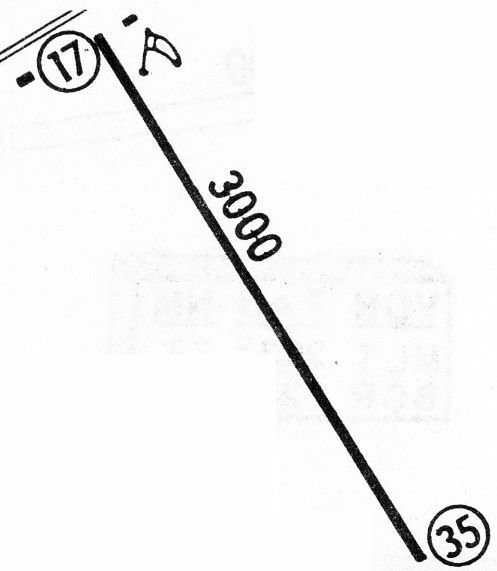 The 1972 Flight Guide (courtesy of Chris Kennedy) depicted described St. Croix as having a single 3,000' paved Runway 17/35. as that is how it was described in the 1976 AOPA Airport Directory (courtesy of Chris Kennedy). 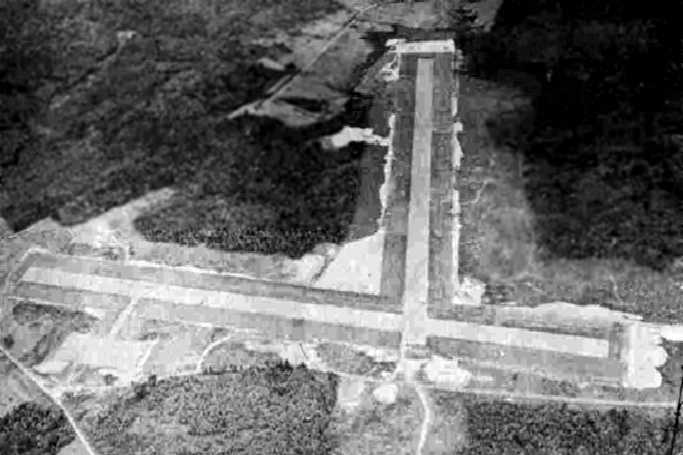 The airfield was described as consisting of a single 2,800' asphalt Runway 17/35. In the 1996 USGS aerial view looking south, a single light aircraft was visible parked at the northwest end of the runway. 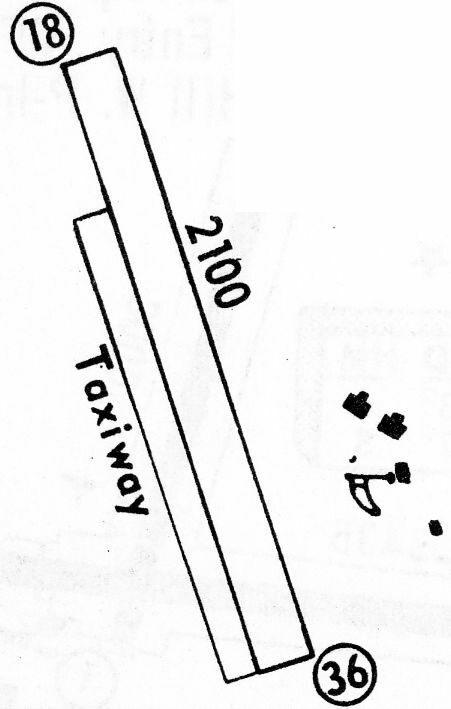 as it was no longer depicted on the Sectional Chart, or listed in the Airport/Facility Directory as of 2004.
along with several buildings at the northwestern end of the field. The site of St. Croix Airport is located southeast of the intersection of Route 1 & Center Street. A summer 1928 photo by Ira Milliken of a biplane & 2 monoplanes in front of the newly built hangar at Scarborough Airport (courtesy of Bill Deane). an avid aviator & president of the Portland Chamber of Commerce. and much of the local action was taking place on the sands of Pine Point & Old Orchard Beaches. who had succeeded his father as president of the H. M. Payson Investment Banking firm in Portland. and had continued his interest in aviation after returning to civilian life. through incorporation & the sale of stock. and hired a contractor, the W. E. Arthur Company, to prepare the site & erect several structures. while the Scarborough airfield was still very much under construction. in what turned out to be a pea-soup fog. he ultimately decided to spend the night at Concord, NH which was in the clear, and try again the following day, Sunday. Sunday proved no better, weatherwise, for the fog persisted. Yet fans by the thousands returned & continued their patient vigil. then flew southeast over Old Orchard Beach. A hole developed in the overcast just long enough for the aviator to land the Spirit of St. Louis on the sand shingle. where he addressed the throng, shook as many hands as he could, and continued the motorcade to Portland. of a biplane & 2 monoplanes in front of Scarborough's newly built hangar. with a huge air show & open house over the weekend of September 27-28, 1928. The air show was a wild success. when a motorist backed out of his parking place & bumped gently into her. and the town meeting in 1928 voted to spend $5,000 to do so. when several front page photos sarcastically showed "the class A roadway"
as a rutted, uneven, gravel track extending a mile & a quarter from Route One to the Airport complex. the blank white 65' wide space over the hangar doors was lettered "PORTLAND AIRPORT". A similar legend adorned the roof so as to be clearly visible to approaching aircraft. long enough for the building to fill during a gust & the entire rear wall exploded outward, damaging several aircraft. This wooden/glass wall was subsequently replaced with a more substantial masonry/glass/steel curtain. operating a flying school & contributing expertise to administration. for what they anticipated would be a flood of young men desiring to learn how to fly. whose family achieved fame via the Luther Gulick Camps at Sebago Lake. They built a log building nearby which today is the home of Post 76, American Legion. Upon completion, the school only managed to enroll 2 students who completed their courses in 1929.
and the building was sold & subsequently became the Plantation Restaurant. It described the field as a commercial airport, located in the town of Scarboro. with 3 grass runways (with the longest being a 3,600' northeast/southwest strip). and the commercial operator was listed as Curtiss-Wright Flying Service. 3,600' northeast/southwest & 3,000' northwest/southeast. A single hangar was depicted west of the runway intersection. and the operator was listed as the Portland Flying Service. 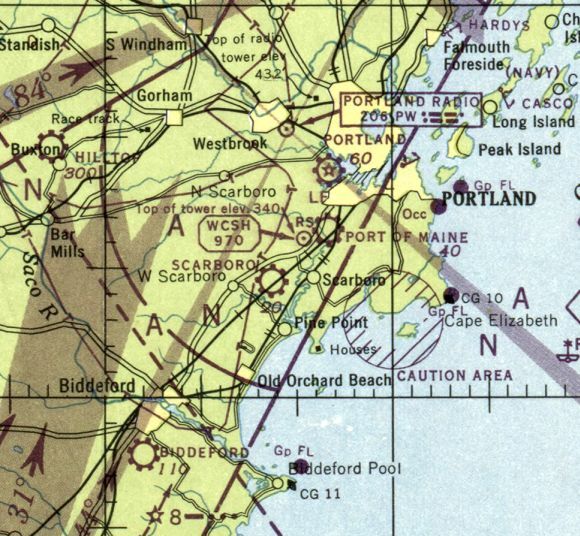 The earliest aeronautical chart depiction which has been located of the original Portland Airport was on the March 1933 Boston Sectional Chart. 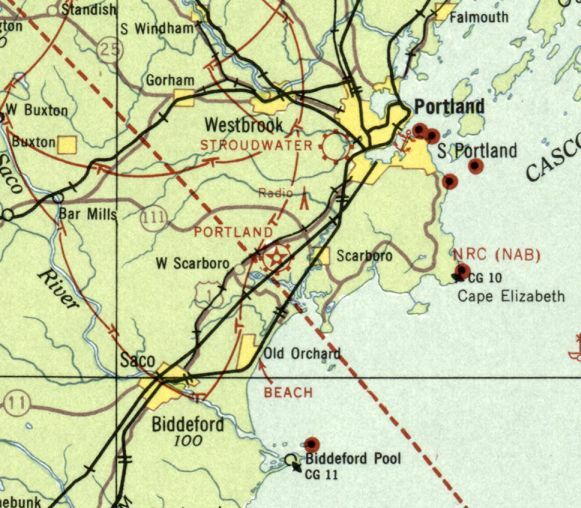 The field was depicted as the "Portland" Airport on the 1934 U.S. Navy Aviation Chart (courtesy of Chris Kennedy). to accommodate the larger, increasingly powerful aircraft being developed. U.S. Route One to the West, and the great marsh to the south, relocation became a priority. Operations moved to Stroudwater in the late 1930s & the Scarborough complex became a flying school. described Scarborough Airport as having a triangular sod & clay landing area. 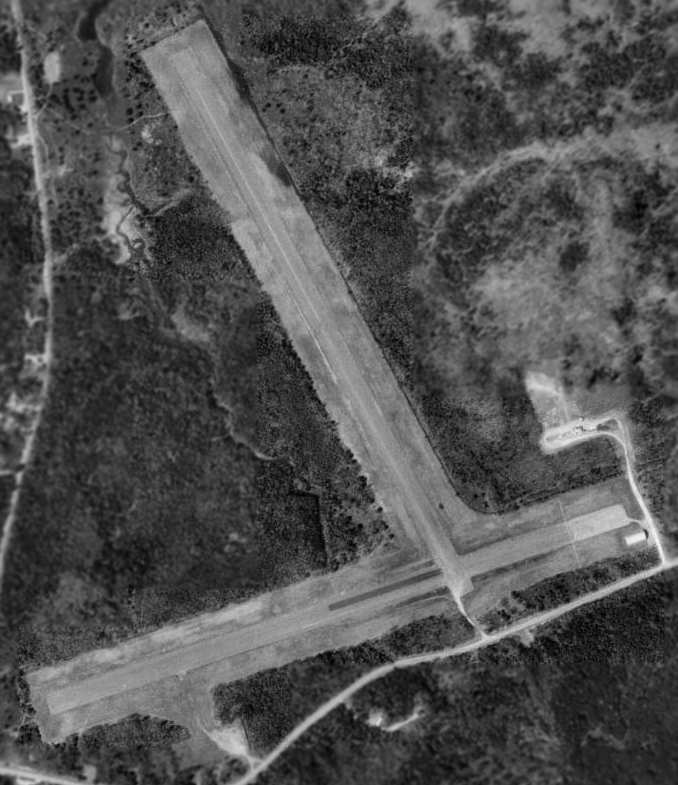 which depicted a single hangar on the northwest edge of an irregularly-shaped grass airfield. The November 1944 Boston Sectional Chart (courtesy of Chris Kennedy) labeled the airport as "Scarboro". as it was labeled “Abandoned Airport” on the 1944 USGS topo map. 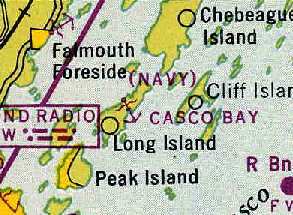 The last aeronautical chart depiction which has been located of Scarboro Airport was on the July 1946 Boston Sectional Chart. Scarborough Airport was reportedly the site of numerous air shows in the late 1940s. as it was no longer depicted on the January 1950 Boston Sectional Chart. 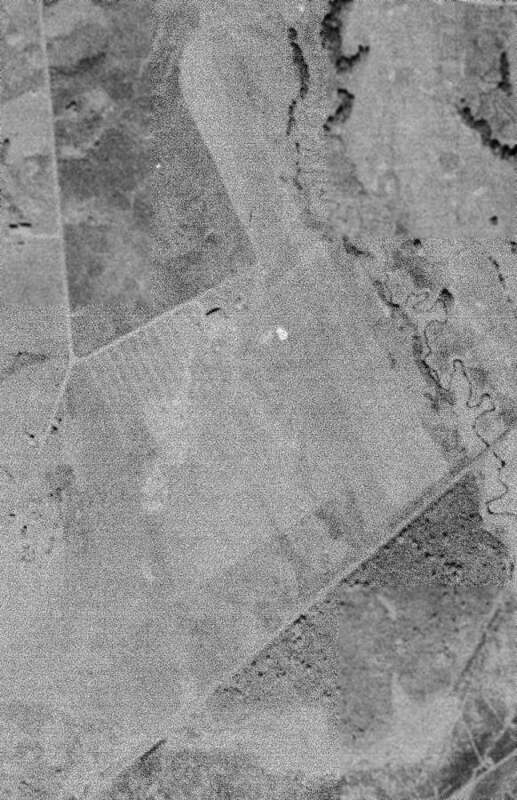 A 1956 aerial photo showed the irregular outline of the Scarborough Airport property, and the airport circle marking. There was a single hangar on the northwest side of the field. The field appeared abandoned, as there were no aircraft visible on the field, but it was intact. or the 1960 Boston Sectional Chart (courtesy of Mike Keefe). Humpty Dumpty notably which stored empty cans & packaging materials there. which left little but a pile of twisted steel & broken bricks among the ashes. The remaining buildings were demolished or moved elsewhere. 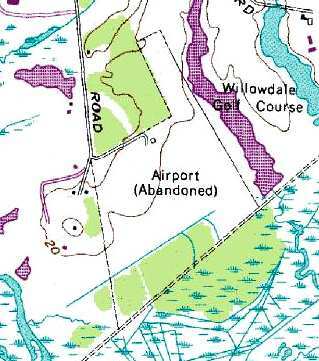 The site of Scarborough Airport was labeled "Airport (Abandoned)" on the 1978 USGS topo map. In the 1998 USGS aerial photo, the site bore no recognizable sign of having been a former airport. Today, the site is the home of the Scarborough Industrial Park. and a Butler-type building now rises where the Lone Eagle waved to thousands of spectators. The site of Scarborough Airport is located southeast of the intersection of Manson Libby Road & Washington Avenue. Thanks to Chris Kennedy for pointing out this location. 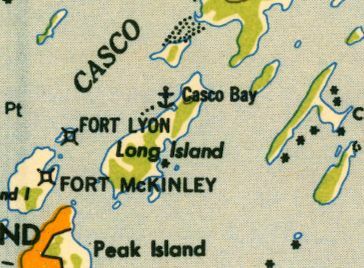 "(Navy) Casco Bay", as depicted on the November 1944 Boston Sectional Chart (courtesy of Chris Kennedy). to support the aviation activities of the surface fleet in Casco Bay. Warren Brayley reported that the land for the seaplane facility was purchased by the Navy from his Grandfather, Elwin Doughty, in 1942. 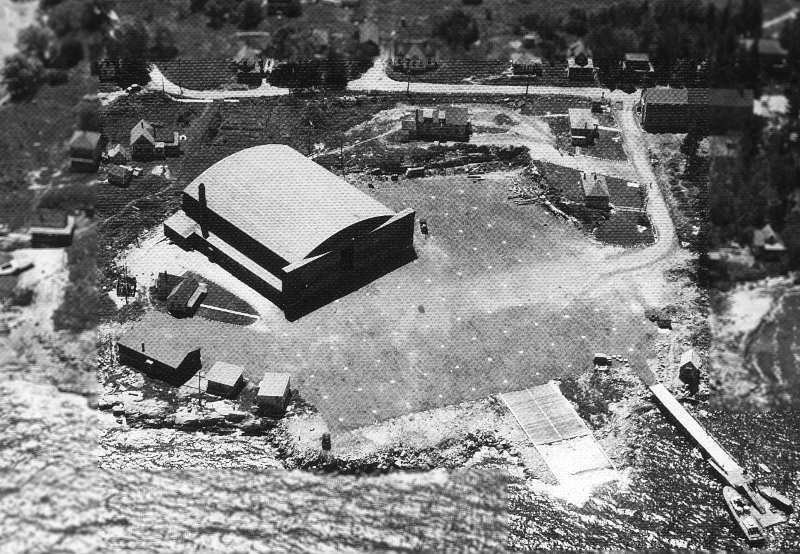 The Casco Bay seaplane facility consisted of 300' square paved parking apron, a single hangar, and a seaplane ramp. with a total capacity of 87 personnel. After the loss of a PBY Catalina flying boat in 1942, Casco Bay was deemed unsuitable for PBY operations. In spite of that, Casco Bay was commissioned in the following year as an auxiliary of NAS Brunswick. with the support of catapult seaplanes assigned to surface naval vessels. was on the November 1944 Boston Sectional Chart (courtesy of Chris Kennedy). but did not specifically identify the seaplane base. depicted a single arch-roof hangar & several smaller buildings on a paved apron, with a seaplane ramp leading into the water. A fire destroyed Casco Bay's hangar & Officer in Charge's quarters in early 1946. 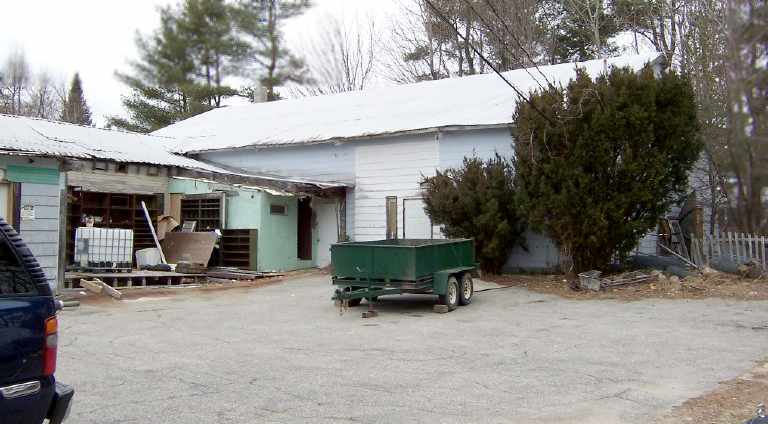 The base was closed later that year, and the property was sold back into private ownership. but that did not turn out to be the case. 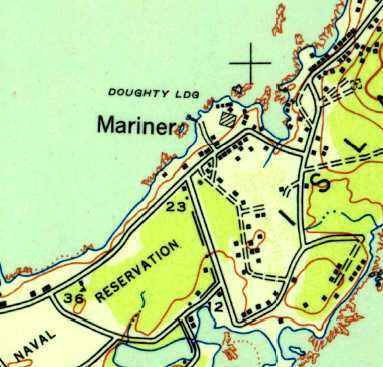 The last depiction which has been located of the Casco Bay Seaplane Base was on the 1949 USGS topo map. with several smaller buildings still standing along the periphery of the seaplane apron. The 1957 USGS topo map still labeled the property as “U.S. Naval Reservation”. 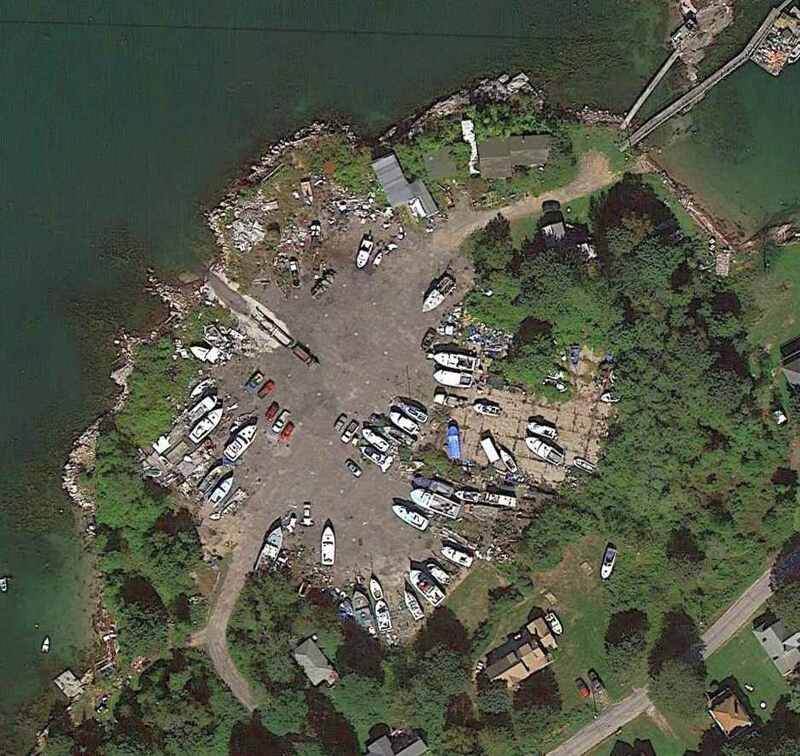 A 9/18/13 aerial view showed the Casco Bay seaplane apron still existed, reused for boat storage. just north of the little town of Mariner. Thanks to Lloyd Momborquette for pointing out this location. A circa 1943-45 aerial view looking north at Fernald Field from the 1945 AAF Airfield Directory (courtesy of Scott Murdock). The date of construction of Fernald Field is unknown. as it was not depicted on the December 1942 Lewiston Sectional Chart (courtesy of Mike Keefe). It depicted Roy L. Fernald Field as having 2 paved runways. described Roy L. Fernald Field as having a 4,000' hard-surface runway. for military aircraft departing from Runway 22 at Dow Field in Bangor. However, none of the many chart depictions which have been located of this field ever depicted it as a military field. Fernald Field was depicted as an auxiliary airfield on the June 1944 Lewiston Sectional Chart (courtesy of Chris Kennedy). 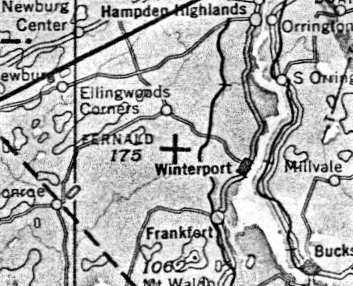 The 1945 Sectional Chart (courtesy of John Voss) depicted Fernald as an auxiliary airfield. as a 517 acre L-shaped property having 2 bituminous concrete 4,000' runways, oriented ENE/WSW & NNW/SSE. 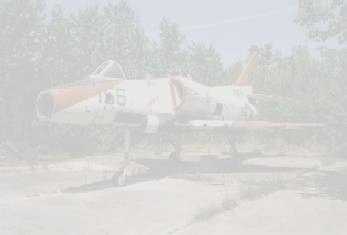 The field was said to not have any hangars, and to be owned by the City of Winterport. with a small paved ramp at the southwest corner of the field. as having a 4,000' hard-surface runway. 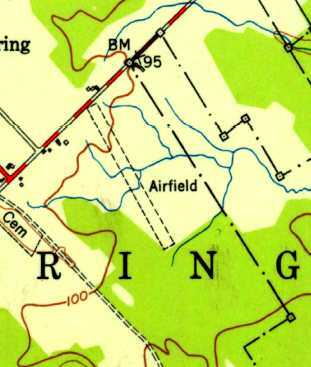 but the airspace over the field was surrounded by an unusual circular Caution Area (C-133) centered on the field. The chart's description of Caution Area C-133 indicated that it was used by the Maine National Guard for "Drone aircraft operation". Was this in reference to target drone operations? 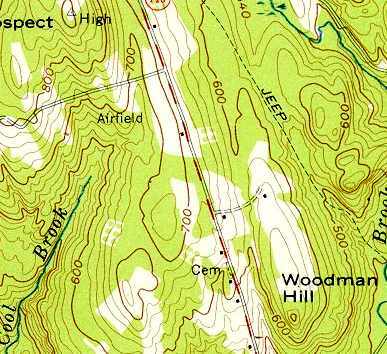 Fernald Field was no longer depicted on the 1957 USGS topo map. as having 2 paved runways, and the operator was listed as the Town of Winterport. was on the November 1965 Lewiston Sectional Chart (courtesy of Ron Kunse). 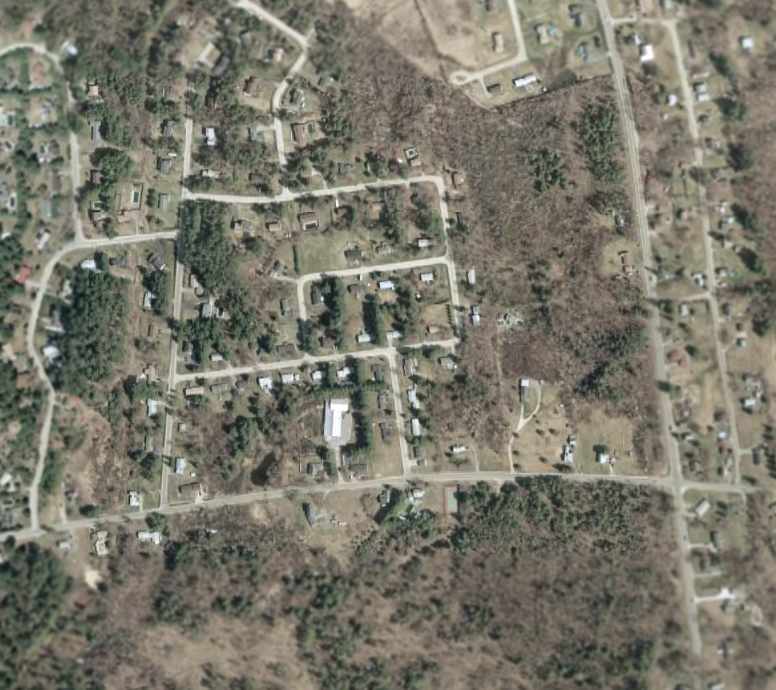 It depicted Fernald as having 2 paved runways, with the longest being 4,000'. 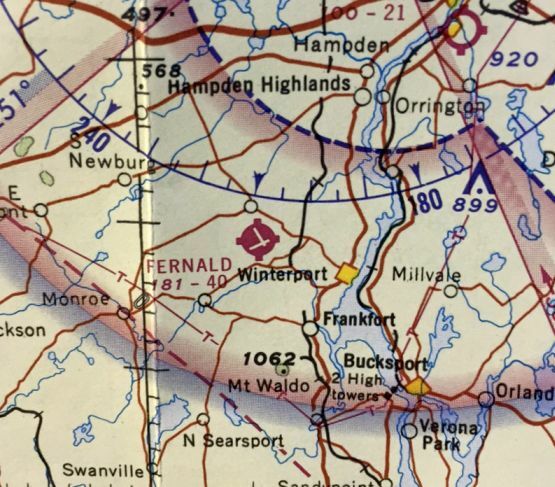 The last map depiction which has been located Fernald Field as an active airport was on the 1968 Flight Guide (courtesy of Robert Levittan). It depicted Fernard as having 2 paved 4,000' runways, with a ramp & 3 small buildings at the southwest end. Fernald was listed in the "low use airports" section of the 1971 Flight Guide (according to Chris Kennedy). along with the remarks "Drag racing May-Nov."
as it was not listed among active airfields in the 1976 AOPA Airports USA directory (according to Chris Kennedy). 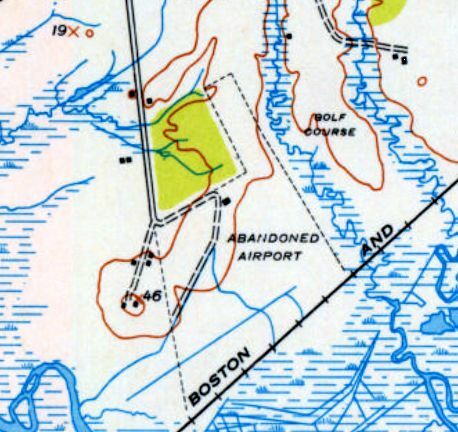 The 1988 USGS topo map labeled the field as an "Abandoned Airfield". In the 1995 USGS aerial photo, both paved runways of the abandoned Fernald Field still remained in excellent condition. but its location immediately adjacent to the side of the runway makes it presumed to have been built after the site's airfield days. The site is now apparently used for drag racing as the "Winterport Dragway". Fernald Field is located northeast of the intersection of Route 139 & Boston Road. set by the company which I pay to host it on the web.